Win Ferdinand: Grab this bull by the horns | SWITCH. From the creators of 'Ice Age' and 'Rio' comes the most love-a-bull family comedy of the year! Ferdinand (John Cena) is a giant bull with a big heart. After being mistaken for a dangerous beast and torn from his home, he rallies a misfit team of friends for the ultimate adventure to return to his family. Based on the classic children’s book, Ferdinand proves you can’t judge a bull by its cover! The 'Ferdinand' competition has now closed. Winners will be announced shortly. Competition opens at 5pm AEDT on Sunday 25th March 2018 and closes at 11:59pm AEST on Sunday 1st April 2018. Five winners will be chosen at random on Monday 2nd April 2018. To successfully win, entrants must fulfil the above entry conditions before the time the competition closes. Current members/followers are eligible to enter the competition. Only one entry per person. Only one winner per household. To be a valid winner, the entrant must not have won a prize from SWITCH within the last 28 days. 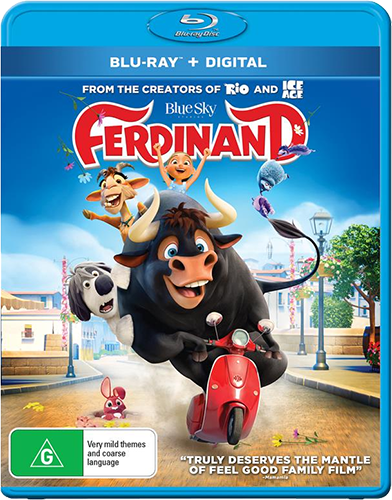 Each winner will receive one Blu-ray copy of 'Ferdinand'. By entering, you agree to receive occasional emails from SWITCH in the future. If you decide to unsubscribe from these updates, any further entries will not be applicable. Only Australian residents are eligible to enter. 'Ferdinand' is available on Blu-ray, Digital and DVD on Wednesday the 28th March 2018 from Twentieth Century Fox Home Entertainment.